Seamless CEO Jonathan Zabusky says roughly 50% of the restaurants his service works with are still taking orders via fax machine. But a new iPad app could make the online food-ordering process even more, yes, seamless. Pick a restaurant on Seamless, the online food-ordering service, and with just a few clicks, your meal will be ready for pickup or delivery. It’s a slick experience, made even slicker by Tuesday’s release of Seamless’ iPad app. But on the back end, the experience is anything but seamless, a minefield of 8,000 restaurants, each with different requirements, resources, and technical capabilities. Of the 8,000 restaurants featured on Seamless–a number that doubled in 2011, and is expected to double again this year–Zabusky says the company has unique relationships with roughly 7,000 of them, making for a “highly fragmented” client base. Roughly 50% of these restaurants are still taking orders from Seamless via fax machine and printed out pieces of paper. All of which makes it that much more remarkable that Seamless has remained seamless for customers on the front end, and managed to process more than $400 million in sales last year, and $1 billion in the last three. Zabusky describes the infrastructure the company had to put in place to accept orders via fax machine still. “When you place your order online, it goes through our system, gets sent automatically to their fax server, and prints out,” he says. “About a minute later, an automated phone call comes to the restaurant saying, ‘You have a Seamless order. Can you please confirm?’ The order print-out provides a randomly generated two-digit code that the restaurant has to key back into the system, so we know when the order has been confirmed.” If the order is not confirmed, a Seamless rep will call the restaurant directly to make sure the order was indeed received. From there, the confirmation is pushed back to Seamless, which in turn pushes out an email confirmation to the customer, who sees none of this friction. In a way, it’s the perfect metaphor for a restaurant: The customer orders from a waiter, and never sees any of the smoke and stress from the kitchen. Seamless acts as the go-between waiter, streamlining the process for both parties. It’s a problem many startups face in trying to overhaul stodgy industries bogged down by legacy systems. Jack Dorsey’s startup Square must often deal with merchants addicted to traditional POS systems, who might not understand the value proposition of an iPad-connected credit card reader. Milo, the e-commerce startup eBay acquired in 2010 for $75 million, is trying to tackle the problem of inventorying local sellers in real time. How does one get mom-and-pop boutiques to adopt such advanced solutions? It’s a hurdle Seamless has had to overcome, but rather than let it be a roadblock, the company has used it as a shortcut into restaurants: getting them on Seamless through outmoded fax machines, showing the benefits of the system, and then up-selling them on better solutions down the road. Even the computer terminal experience–a kind of second-rate solution in between fax machine and POS systems–was designed to this end. Now, in addition to creating an iPad app for customers, Seamless is looking into creating an iPad solution for restaurants. Zabusky imagines this solution will become more accessible as iPads and Kindle Fires become more widely adopted and less expensive. “There is no doubt the solution will become easier,” he says. 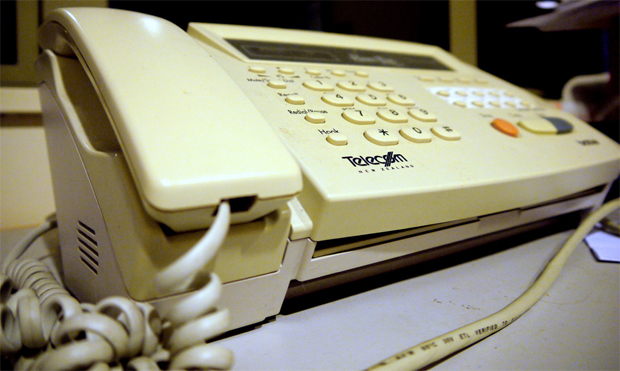 In the meantime, if ever your food is late for delivery, you can probably blame it on that pesky fax machine.